This week has been very trying for us at Chez Diva... Artoo's throat virus made its way to me, and to Chewie and finally to B-rad - we're all feeling, kinda...uhnnn.... bleh. Monday morning B-rad stayed home from work to be with Artoo so Chewie and i could go to the doctor...and let me just say that Chewie does NOT like to have his throat inspected, but even more than that, he hates having his ears touched. You wouldn't think a 3 year old could be that strong! On Tuesday we got slammed with a big fat snow storm. And Artoo just slept a lot this week - and had a brief stint of eating nothing but vanilla yogurt for 4 days. A week of no sleep and feeling mostly like warmed up garbage.... fun fun fun! We are all starting to feel better, but like i said, this nagging cough - it's the worst. LUCKILY FOR ME (and for you!) 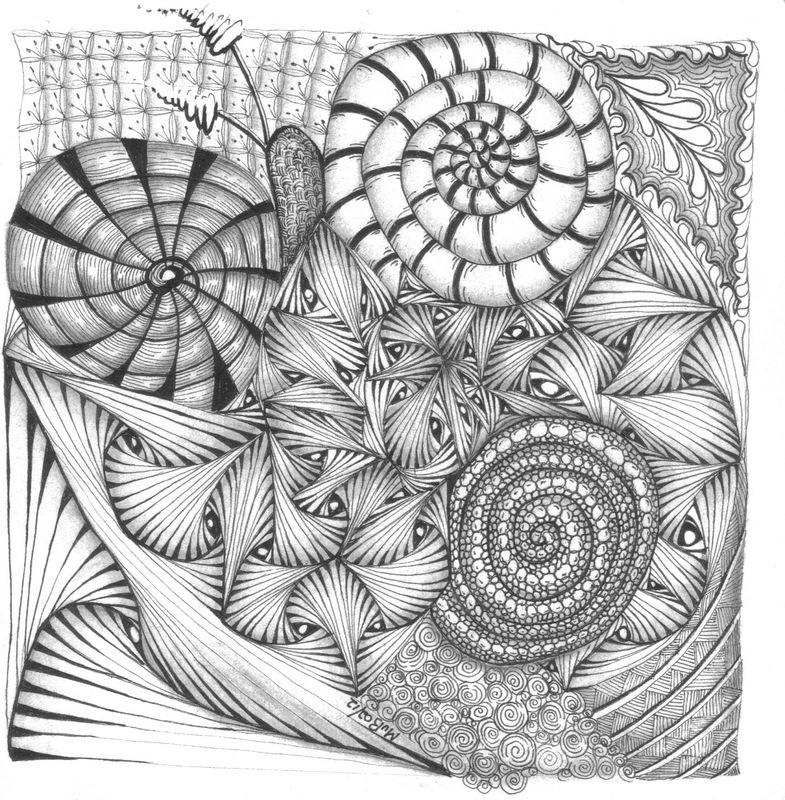 this week's challenge will be brought to you by Certified Zentangle Teacher, Marizaan van Beek, all the way from South Africa! Let's welcome her! the spiral string moves counter clockwise into the center. I posted the challenge Spiral vs Paradox because of my own challenge. At the seminar Paradox proved to be my nemesis. So I am a spiral person and decided to combine the triangle and the spiral just to say I have mastered the challenge. I used a big spiral as the basic string and drew lines inside the curves to make triangles, and just started tangling. 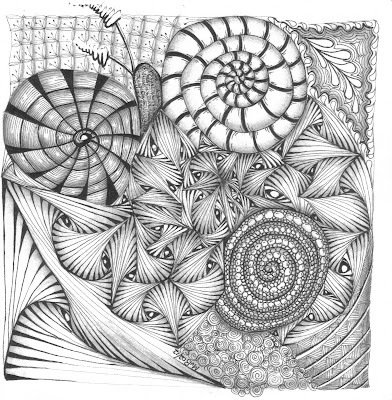 Life is about obstacles and Zentangle has proven once again that they can be overcome. I am from South Africa, have two teenagers, and I am married almost 20 years. 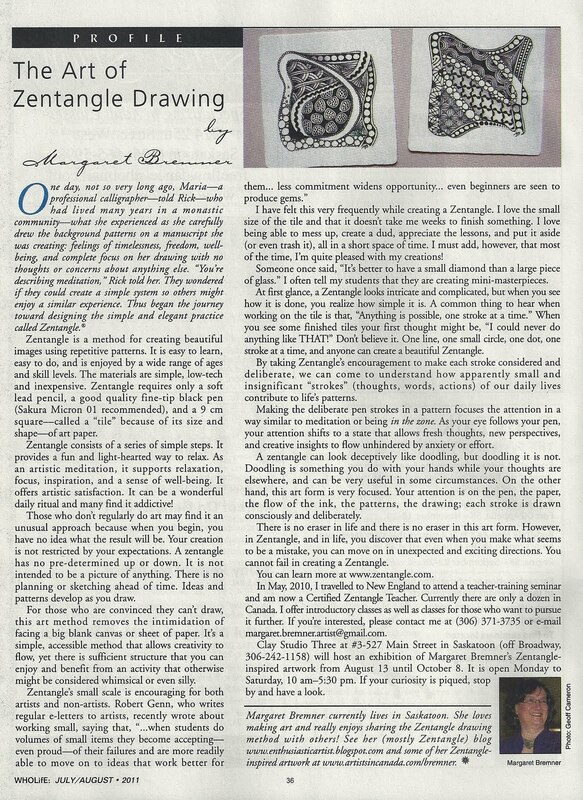 I saw Zentangle at a camp 4 years ago from someone that was taking classes from a woman teaching Zentangle - not a CZT. How Ironic is that ? Well I made up my mind that this is what I want to teach because it brings my Social Work background and my love for art together in one teachable medium to people that often feel left out in the art department and in self esteem. So off I went last year in October at the first seminar in Providence and proudly became a CZT#7. Wow, Marizaan, this is so beautiful and a big inspiration. I can't wait to do this challenge! Laura, as always, we are sending you and the fam our love. I've never quite understood paradox, so this was hard for me. I'm not sure I did them right. I started to put the shading in ink, but changed midstride to pencil. You can all see where that happened. LOL! Thamks Laura!! i know what you mean - Paradox is definitely a trickier tangle. Did you take a look at Margaret's tutorial? that might help. I meant "thanks" Laura! LOL! Marizaan, this is really a challenge and I am determined to make it work some way, some how....only time will tell. The piece posted is so fantastic....the task feels daunting, however I will muddle through the test tries until I find a happy ending. Laura, I was hoping you will be feeling 100% but it does sound you are on the mend. The snow, is cabin fever setting in? We are in the midst of spring here, I hope it comes your way soon. Have you tried honey,lemon, and cayenne, in a warm tea? I find it makes a world of difference. I hope for a great week for you and yours! Thank you so much Marizaan for this great challenge. Laura I hope that everyone is feeling better soon. I hope I understood this challenge correctly. Anyway, I've always liked the paradox tangle pattern and it was a challenge to use it within the spiral and not lose the spiral pattern itself. Laura, hope you and your family are feeling better soon! Hi, Laura. Take care of that back of yours. You need all the strength to carry your cutie-pie, Artoo. You still manage to come up with great ideas for the weekly challenge. Great challenge - I love Paradox! Hope all is well on the homefront - we're getting a warm spell here in Ontario (snow is melting.... yay!). Great challenge! I had trouble at first with Paradox, but once I realized it is easier to not lift the pen I was ok. It is a little lopsided, but they say no mistakes in Zentangle! Hi All, not been able to do many tangles lately but I do pop by to see what you have all been up to. lol, when I looked at the tangle done by Marizaan, up close, all I could see was a bunch of birds, their eyes beaming out from among each other, reminding me of babies in a nest waiting to be fed. Even the other spirals remind me of twine and material birds would use!!! A very fun piece. Tanks Ruth I always enjoy when people see something joyful that i missed. Hi Everyone - I'm new to blogs and Zentangle but I think I managed to add my entry to the list for this weeks challenge... I think I inadvertantly added it to last weeks too... Sorry! My first Zentangle Challenge. Thanks! It was fun! Lovely challenge, can't wait to make time for it! Primero agradecerte la oportunidad de participar y que compartas tu fantástico trabajo. Soy nueva en esto y autodidacta, en España se hace muy poco TANGLE , y estoy aprendiendo a través de vuestros blogs. ¡somos felices de tenerle ensamblarnos! This was a tough one in the beginning because I had never used this in a tangle before. But I saw the very wonderful instructions on the Tangle Patterns site. So I just kept thinking "thin to thick, thin to thick" meaning that every time I turned I would start with a point and open the other end. I did my string with three spirals and from then on it was great fun. Thank you Laura and Marizaan. What a fun challenge! Thanks Laura and Marizaan. I haven't done Paradox in a while. It was just what I needed today to give myself a chance to focus on something other than my sick kiddo. Super cool snow, we had 29 degrees celsius here in Tassie today. Hot for our autumn. This was a tough one, but fun because I really like paradox. Thanks for continuing to hostess this! Super challenge this week!Paradox is one of my favorite tangles! Laura, I have directions on my blog on how to turn off the word verification if anyone is interested. Thanks! Awesome challenge...now off to see all the other artwork. This was a great challenge because it really sharpened up my paradox skills! I plan on doing another tile that is strictly spirals and paradox! It will also more than likely be black on white instead of white on black. Loved it!! Thanks Laura and Marizaan! Paradox is one of my favorite tangle and along with a spiral it was a great challenge!! Well for me it was pfffff, I made it myself too difficult. Normally I find the paradox lot of fun! Tried a new material this week...visit me at Tanglefish blog to see! The scan doesn't "reflect" it's true appearance, but that's okay. Thank you Laura and Marizaan for the challange--this is an intriguing one! I hope I have time to finish another! Thanks for the intriguing challenge and hope all at your house are feeling much better! 3 weeks in a row posting the Challenge - it's almost a habit again. Thanks for getting me motivated again, Laura. Marizaan, what a great challenge! I love your tile. So amazing! Thanks for the great challenge! After I submitted mine, I went back and looked at the tutorial - should have done that first ;) At the end of the tutorial, all the samples were put together - it looked so cool that I spent the rest of this week doing my own Paradox study with lots of variations. Lots of work, but I feel much more confident using this fabulous tangle now! Thank you for this challenge,I hope I am in time for today. Was again a challenge so use paradox,I love this tangle!! I really liked the paradox tangle also! I am so impressed with the tangles that everyone else does - thank you for posting these challenges and maintaining this platform for sharing. It is so inspiring. This was fun. Love everyone's tangles. It's a great learning experience. I am "Tangle Inspired."